Are you doubting your ability to homeschool high school? Believe me when I say, if I can do it, anyone can! The high school years have been my favorite part of the homeschooling journey. 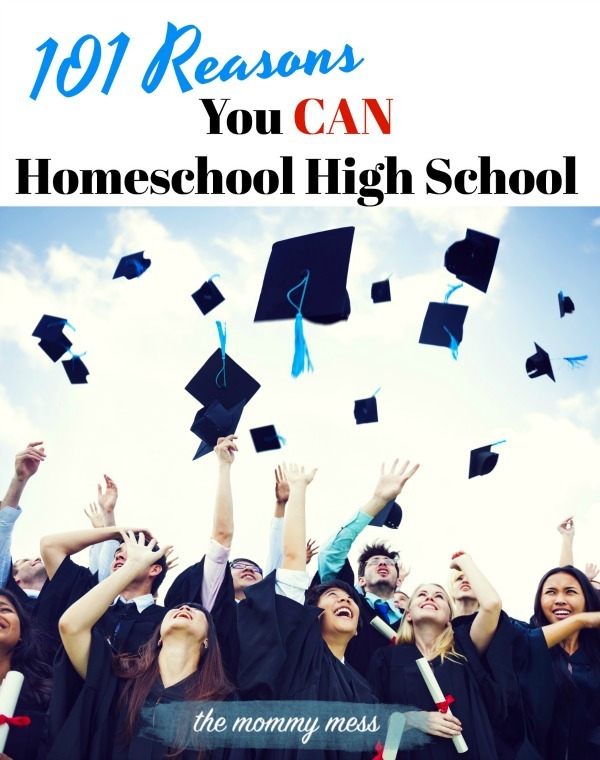 At first, the thought of homeschooling high school was overwhelming, but I promise you it is possible! I'm so glad we stuck it out with our oldest and I'm actually looking forward to those years again with my youngest. I'm no longer worried about high school. It's the fun part! 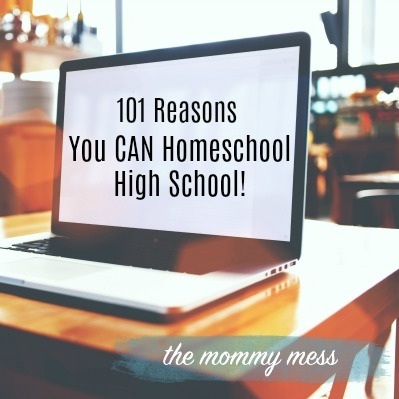 If you need a few reminders you're up for the task here's my mega list of reasons you CAN homeschool high school! *This post may contain affiliate links. Using them helps support this blog. 1. High schoolers are independent. 2. Creating high school transcripts isn't as hard as you think. 3. Homeschoolers CAN get scholarships. 4. It's nice to let your high schooler make their own schedule. 5. Your teen will be excited to study areas of interest in depth. 6. Homeschool graduation ceremonies are a thing. 7. Teacher's editions help you plan, teach, and even learn along with your child. 8. Use live DVD instruction to help with higher level math. 9. Housework is easier when your kids are older. Just sayin'. 10. Online classes keep your teen accountable to teachers. 11. Flexible schedules make family vacations easier. 12. There are plenty of curriculum choices for homeschooling high school. 13. Dual enrollment provides a classroom experience. 14. Homeschool co-ops are great for completing high school lab experiments. 15. High schoolers appreciate the work you're doing and it helps make your job easier. 16. Less anxiety for your teen. 17. Earn college credit while still in high school through dual enrolling. 18. You're the most important role model for your children. 19. A flexible homeschool schedule makes earning volunteer hours for scholarships easier. 20. Look for positive online support groups for homeschooling high school. 21. Online classes take some of the work off of your plate. 22. Teens thrive in an environment free of peer pressure. 23. You don't need to be an expert on every subject. High school students are excellent self-teachers. 24. You can work anywhere with teens! The local coffee shop makes a cozy classroom. 25. You'll never regret the extra time with your teen. 26. The conversations you get to have over breakfast are heavenly. 27. Your teenager will thank you. 28. Colleges and universities welcome homeschoolers. 29. You can save thousands of dollars on college through dual enrolling. 30. Siblings get more quality time together when your older ones would otherwise have a completely different schedule than younger brothers and sisters. 31. You don't have to miss out on "high school fun". 32. High school football games are open to the public. 33. Lots of homeschoolers go to Prom. 34. Homeschoolers can participate in extra-curricular activities and sports. 35. Build a stronger relationship with our teen through experiencing this journey together. 36. Colleges and universities accept homeschool transcripts. 37. There are plenty examples of successful homeschool graduates in college and the workforce. 38. You worked SO hard all these years-now is the time to see the fruit of your labor! 39. When older siblings are home they tend to jump in and help teach younger ones, giving mom a little break every once in a while. 40. A flexible homeschool schedule allows for job opportunities that wouldn't be available to a student in school from 7:00 am-4:00 pm. 41. Hobbies and special interests can often be turned into a course of study worthy of an elective credit. 42. Select curriculum with DVD instruction to help you teach higher level math. 43. There are plenty of live online courses available too. 44. You will love reading all your favorite high school books again with your teen. 45. Managing a flexible homeschool schedule is excellent preparation for college, where your child will have to pick and chose from courses on varying times and days. 46. You know someone who can teach chemistry. Or writing. Or whatever you're afraid to teach! 47. Homeschooling high school is more about managing your child's education than it is about actually teaching them. 48. High schoolers get involved in the planning and help guide you. Listen to their passions and pay attention to their interests. 49. Older students learn to manage their time well. AKA less nagging from mom. 50. Homeschooling helps build confidence. As your children get older they become part of the homeschool discussion. They learn to speak for themselves and articulate why they love homeschooling too. 51. You will cherish the extra time together as a family. 52. The teen years are tough! Homeschooling allows a safe space for your high schooler to mature at his own pace. 53. Homeschooling high school isn't just your choice anymore. Get your teen involved! 55. You can keep track of records and grades through an accredited private or umbrella school. 56. More sleep for your teen helps with learning, focus, and mood. 57. Extra opportunities to build character and self-esteem in your teen. 58. Form book clubs with peers and read high school literature with a group. 59. Homeschool students can take the SAT and ACT. 60. College admissions services are available to dual enrolled students. 61. You spouse supports you. 62. There's no rule you have to stop at the high school level. You got this! 63. You will enjoy teaching the older grades. I remembered algebra. First-grade history? Not so much. 64. Your high schooler can earn college credit for what they already know by taking the CLEP exam. 65. Reach out to other homeschoolers in your area and form a study group for higher level math and sciences. 66. Your teenager will appreciate all the hot meals! 67. You can pick the books your child reads. Your kid will survive if they don't read Romeo and Juliet in 9th grade. 68. College advisors will assist your dual-enrolled student map out a course plan. 69. Trade teaching subjects with other homeschooling parents who may excel in an area you don't and vice versa. 70. Tutors are available if your child is struggling academically. 71. Teens going through a hard season will benefit from the extra time at home for appointments with doctors or therapists. 72. Less running the roads! 73. No demanding early mornings. 74. Homeschool conventions are a great way to find resources and encouragement for homeschooling through high school. 75. If your teen has a part-time job, he'll have more flexibility for work hours. Employers LOVE homeschoolers! 76. Homeschooling high school will give you hope for teaching the younger ones. 77. You can outsource any subjects you don't feel comfortable teaching. 78. Your kitchen counter will make a great biology lab. 79. You'll find answers to whatever you don't know together. Thank God for Google! 80. Teach courses with another family. Something like this personal finance course would be great for a small group setting. 81. Internships or apprenticeships will be available to your teen during traditional school/work hours. 82. Talk with other parents who have successfully homeschooled high school for encouragement and wisdom. 83. It's nice to have a flexible schedule during your child's senior year to focus on visiting colleges and universities, completing applications, or taking important tests. 84. You'll have a happy teenager. 85. You've learned to take care of yourself by now and you're ready for this. 86. God will continue to equip you for this task! 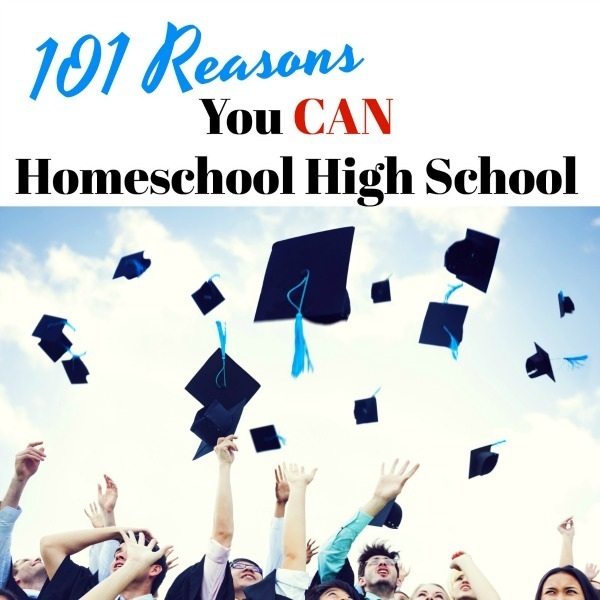 Need EVEN MORE REASONS you CAN homeschool high school? If you're looking for reasons to keep up the homeschooling mission at any stage of the game, there's a ridiculously long list of bloggers who have you covered! 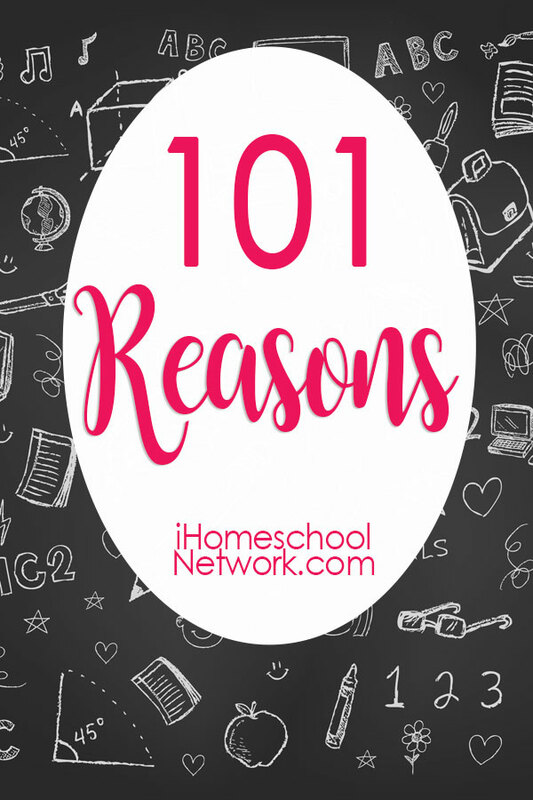 Check out 101 Reasons at iHomeschool Network!